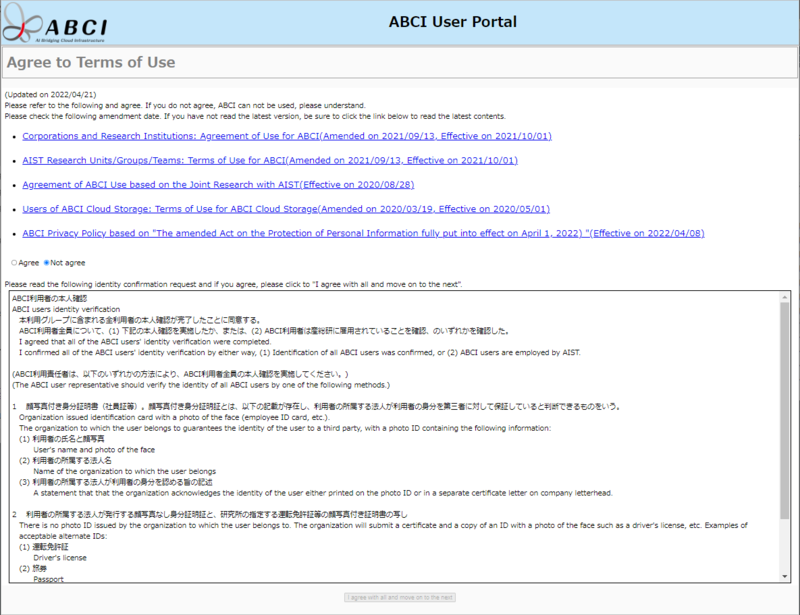 Access New registration on ABCI User Portal. Select "New" and click the "Next" button. Enter all items, and click the "Next" button. 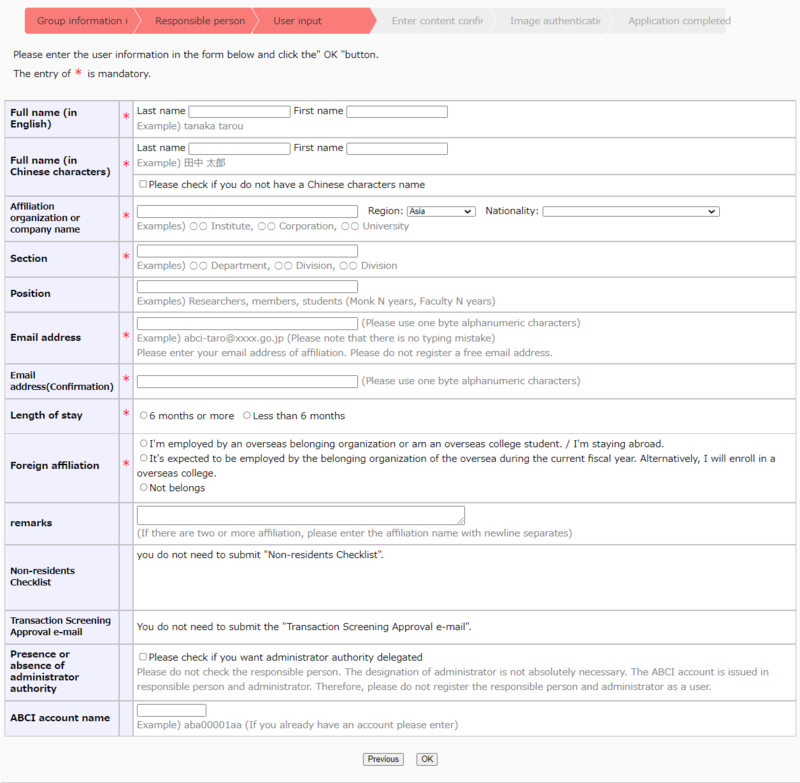 Enter the application responsible person information, and click the "OK" button. The entry of "*" is mandatory. 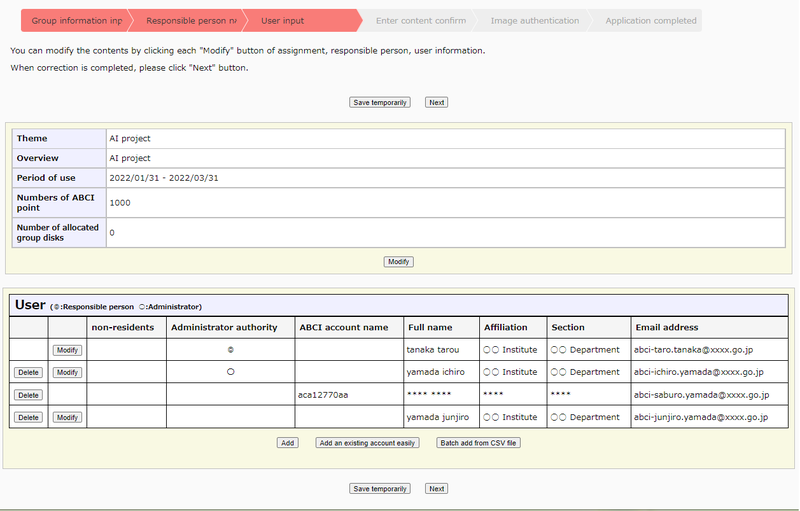 If ABCI account name is blank, a new account will be issued when application is approved. When clicking "Add" button, screen for user input will be displayed. 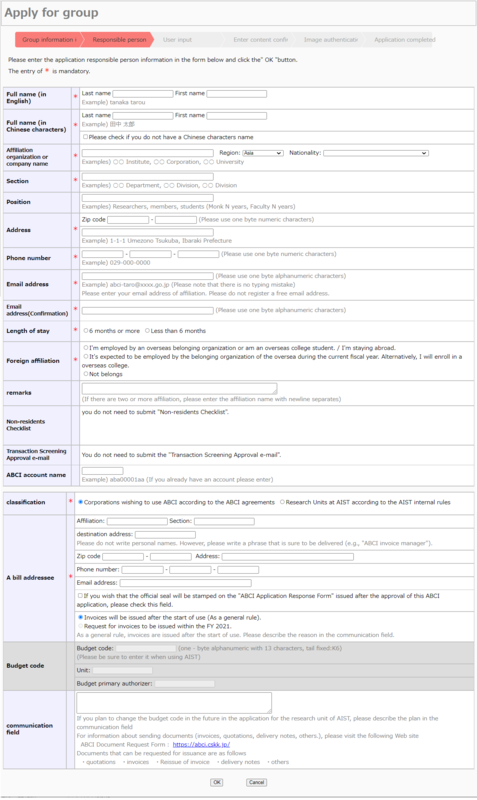 Enter each items about users who participate the group, and click the "OK" button. The entry of "*" is mandatory. The list of users you entered will be shown. When clicking the "Modify" button, you can modify the target user information. When clicking the "Delete" button, you can delete the target user. When clicking the "Next" button, screen for confirmation will be displayed. Confirm the input information and click the "Next" button, To modify the input information, click the "Modify" button. 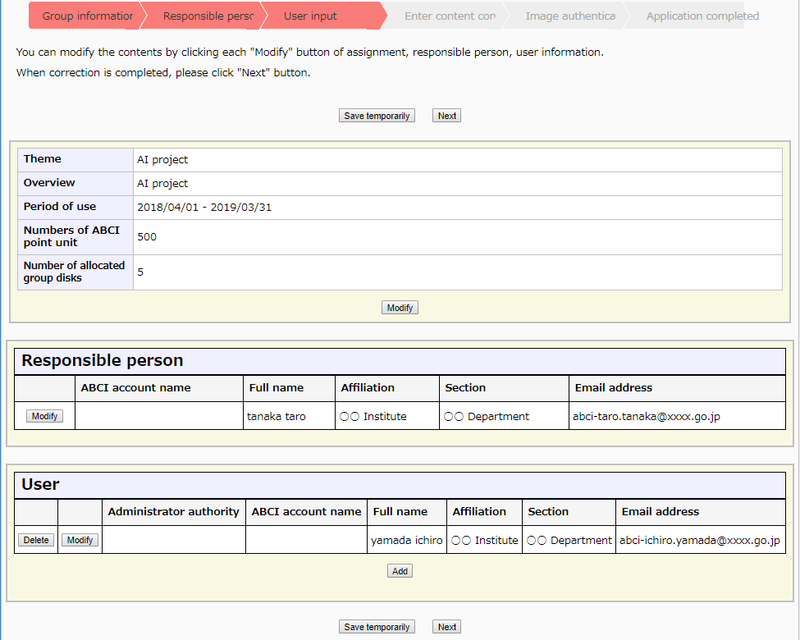 On the screen for modification, you can modify group information, responsible person information and user information you entered. When you click the "Modify" button, screen for modification will be displayed. To delete user information, click the "Delete" button. To add user information, click the "Add" button. 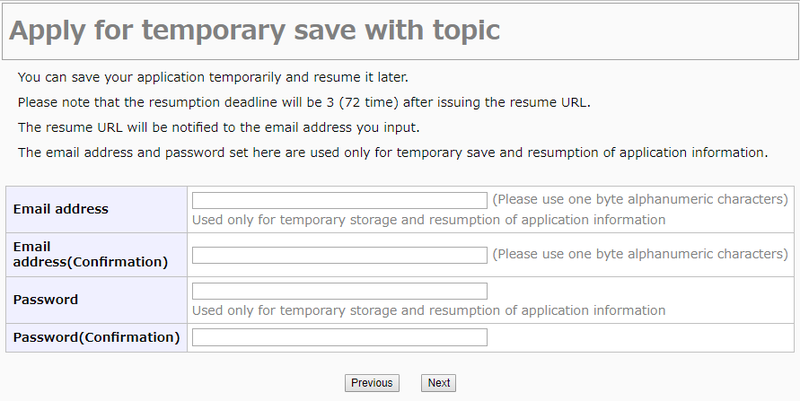 To save your application temporarily, click the "Save temporarily" button. 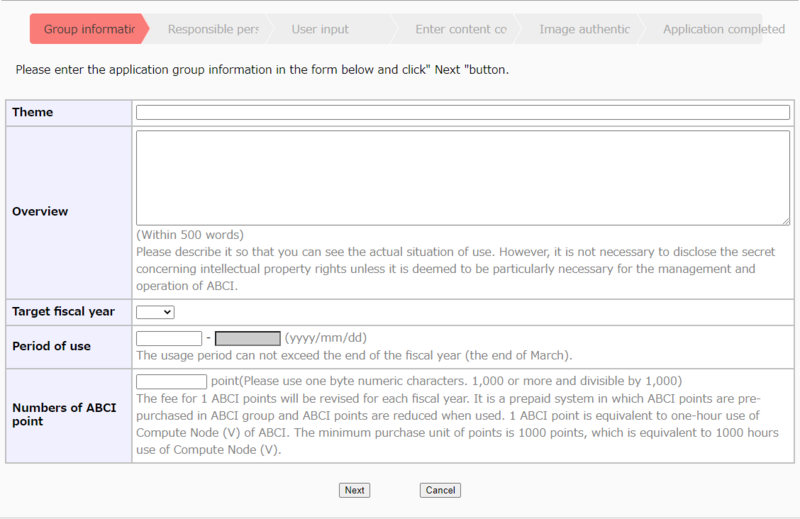 Enter the number of 6 characters in the image and click the "Apply" button. If it is difficult to read numbers, click the "Reload" button. The different image will be displayed. Your new application is completed with above. When your applicaiton is approved, responsible person will be notified by e-mail. Click the "Save temporarily" button on the screen for user input or modification. Enter 6 numeric characters and click the "Next" button. If you cannot read numbers, click the "Reload" button to change the image. Enter your e-mail address and password, and click the "Next" button. This e-mail address and password are only used for resumption. The URL for resumption will be notified to the e-mail address. To resume the application, launch your favorite browser and copy/paste the URL. Enter the password, and click the "Next" button. You can resume the application from "User Input".